With Thanksgiving just behind us and Christmas fast approaching, we’ve reached the time of year where we're all called to reflect on what we’re thankful for. When you’re working with people who have less than you do, it’s not hard to come up with answers to that question. I’m obviously lucky to have been born into the stable situation that I was, and I’m lucky that so far, I haven’t faced any major threat to that stability. Scotty making coffee for our guests. But, even though there's certainly nothing wrong with being thankful for what I have, I’ve always hoped that my service experience would be more than just a fuel for my gratitude about my own life. It would somehow feel cheap if the guests were merely reminders to me of how thankful I am for my privilege. And it’s worked out so far, because they are much more than that. I can’t tell you how many times I’ve been touched by the thoughtfulness of the people I serve here. Helping me carry loads of laundry up the stairs, asking me if I’m okay as I awkwardly try to de-escalate a conflict, surprising me with a candle on my birthday, gladly serving dinner with us when we’re short on part-time volunteers – these are just a few examples of the compassion I experience daily, even when I do little to earn it. I used to be taken aback to see this kindness from our guests. Then I realized that my surprise revealed my own false assumptions about people living in poverty. If I were without a home, or struggling to take care of myself and my family, or spending days with people passing me by in the street – if I was in survival mode – I always thought I wouldn’t have any emotional capacity left to empathize with strangers. 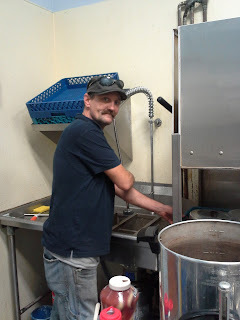 If I ate at a soup kitchen, I imagined that the staff working there would be the last thing on my mind, so I assumed it would be the same for the people I serve. But guests continually show me how wrong I was, how much they do think about us. I talk about “the people I serve,” but they serve me at least as much as I serve them, and in ways that go deeper than supplying food and clothes. 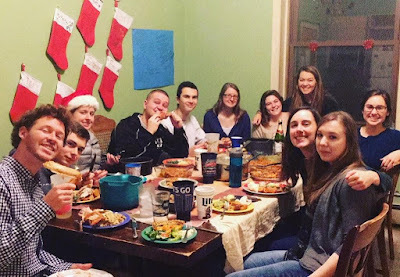 The other full-time volunteers that I work and live with are likewise impactful, and I can’t write about thankfulness without mentioning them. I love being part of a community that cares about our guests at least as much as I do. Seeing my fellow volunteers consistently handle difficult situations with patience and compassion makes it easier for me to do the same. Struggling through the gray areas that come with working in emergency services is less overwhelming when others are there to process it with you. That’s not to say there are never any challenges that come with living in a house full of 11 people. But if it weren’t for our community, I have no doubt that the year would be much harder for me than it is. That is what I’m thankful for: all of the beautiful human beings I’ve met here. And I could still go on to include former volunteers who continue to be a support network for us, or staff members who make us feel welcomed and valued, or part-time volunteers who donate their time and meals to the kitchen. It turns out that the most powerful part of this experience is simply the people it brings into your life, and I know I’ll continue to be thankful for that long after the year ends.